I went out on a friend’s boat today called Reelality in search of some wahoo. 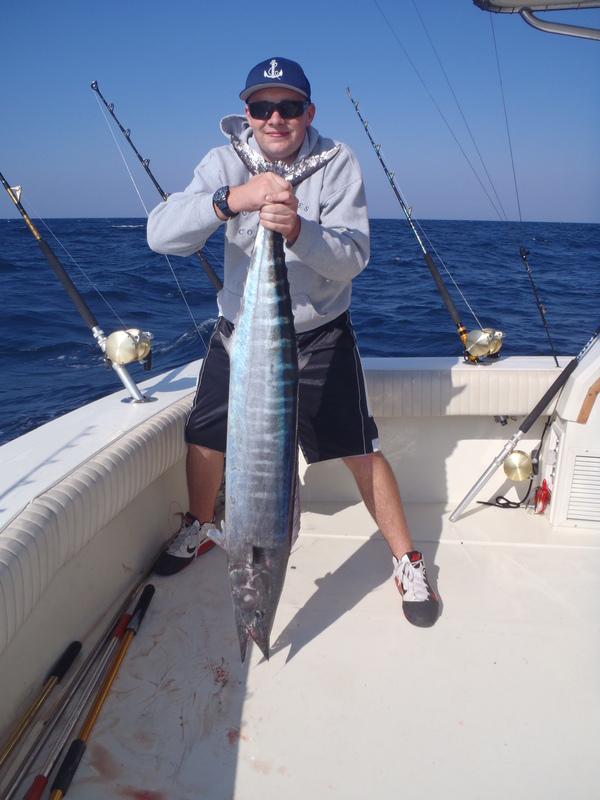 His son, Stephen, and friend, Mike, had never caught a Wahoo, nor had he put wahoo on the deck of that boat yet. The 15-20 knot SW wind they called for late in the afternoon was already blowing, and the seas were a choppy 3-6. With that we stayed fairly close to home, but ran to where Wahoo have been holding in good numbers the past 6 weeks – the infamous Hot Dog. We got there around 9:00 am and were fishing in 73.5 degree blue-green water with scattered weed. 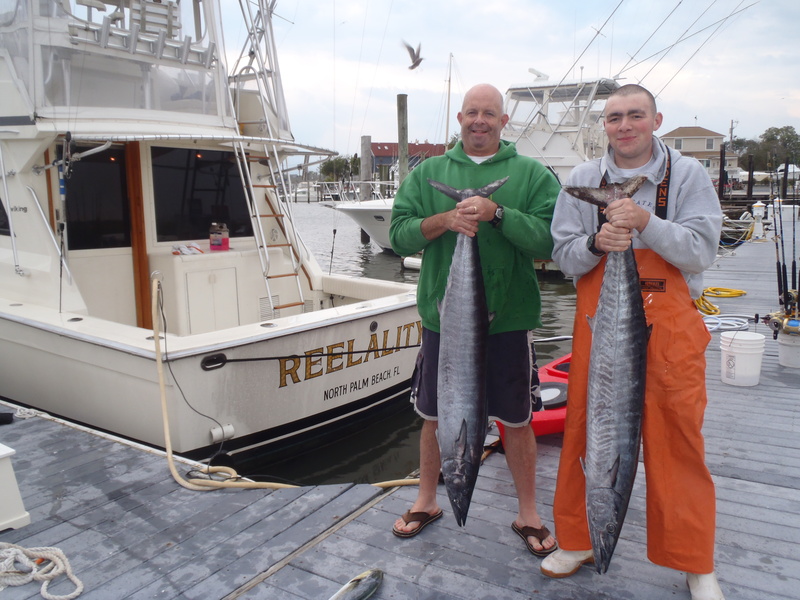 We pulled a spread focused on catching wahoo with mostly skirted ballyhoo on wire and two planers down about 15-25 feet. Our first bite was a small dolphin which we bailed in the boat. Shortly after we had a wahoo crash our way back blue/white Joe Shute and take a hard run. Stephen was on for his first ‘hoo and brought it to the gaff after a 20 minute battle. We got back on the troll and had a little lull in the action before we got hammered again by another wahoo on the same bait. Mike fought it for about 15 minutes before we sunk the meat hook into its head. Keith kept working the Hot Dog since the direction we wanted to go would have been a head sea all day. We had two mystery bites that just never came tight. I saw the splash on one of the two and it looked like a wahoo bite, but I can’t confirm it. The way the bait came back on the other made me believe it was a small dolphin. At about 2:00 pm we picked up and ran in. Successful day since the goal was to get two people their first wahoo. I can’t wait to slice some up for sushi! Due to some information of fish being closer to home, I changed my decision to make a 75 mile run and keep things closer for the day, along with the fact that some of the crew couldn’t leave until later and the questionable weather. We ran the Trade In to the Cigar looking for a weed line and a temperature break that was there the day before, but nothing ever developed. We were in 71 degree green water. After looking around for an hour or so, I had zero confidence in the area and we pushed 18 miles South to the 30 line and worked our way South which gave us a down sea troll in the 3-5 foot chop. We managed to get 4 dolphin by pitching spinning tackle to some floating debris, and then picked up another off of the planar, but overall it was a slow day. We did get a wahoo bite, but the ‘hoo hit out in front of the bait, mangled up the wire, and missed the hook. At the end of the day we finally found clean water and 73 degree water temp around the Tea Cup, but we had to leave. We could only make 16 knots in the head sea for the first hour but then it laid out for us to do 34 knots the rest of the way home. Overall, the day turned out to be a major bust – I should have stuck to my original plan. I went out on the Boss Lady for an Overnighter to the Lindenkohl Canyon. The charter was a group of regulars for us, so we were pretty stoked about the trip and wanted to get them into an all out overnight bite. We pushed off at 10 am and cruised out to the canyon at a steady 25 knots. 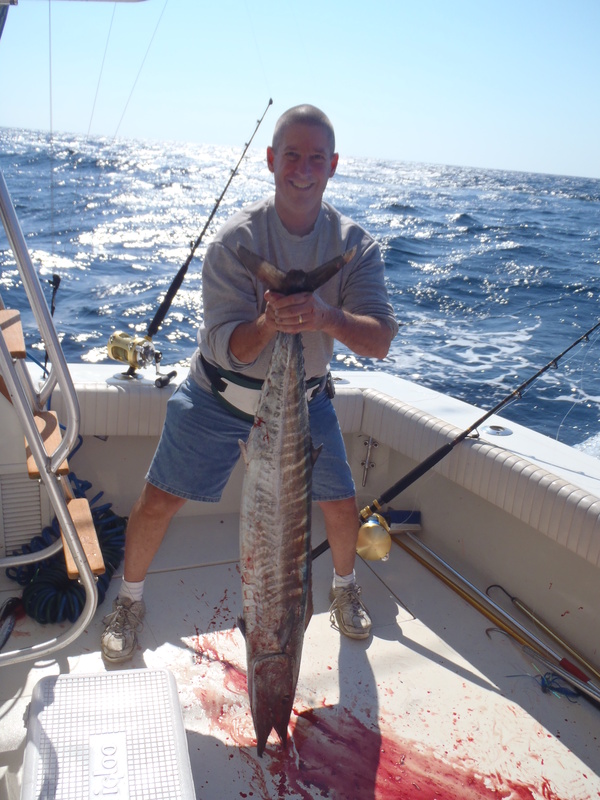 We got on the troll for a while and heard some reports of wahoo being caught, so with that we dropped a planer down with a blue/white Hawaiian Eye and it didn’t take long before it was hammered by a nice wahoo that we estimated to be close to 70 pounds!!! It was Andy’s first, and definitely a catch of a lifetime! We continued to troll but there wasn’t much to get excited about with the baitless, blue green 72 degree water. We setup in about 300 fathoms and our drift was East all night. The weather was pretty decent aside from some rain throughout the night. We managed to catch a few live squid for bait and at about 2 am we hooked into a nice 70 pound yellowfin which Todd brought into range of our gaff after a solid battle. It went quiet after that and we had one more on for about 10 minutes and it pulled off. 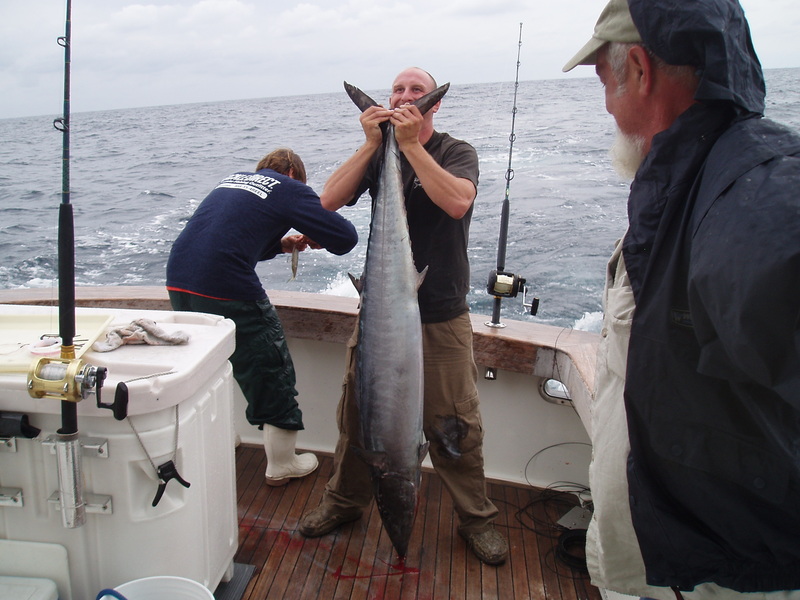 We unfortunately didn’t get on the tunas, but a few boats found them thick in about 1000 fathoms. Unfortunately the bite was right before sunrise and it was quick. As the sun came up, so did the West wind so we ran inshore and tried for a wahoo for about another hour, but no takers other than a small bluefish.